Getting bored at work right now so thought I'd start this little thread listing out, you guessed it, all transfer rumors associated with us. Yeah, the season's still going on but c'mon...we don't really have much to look forward to...8 more games and thats it. Of course, we do need to get that 4th spot in the league or this list just becomes redundant. Last edited by RobHood on Thu Jun 12, 2008 5:13 am, edited 12 times in total. Good stuff RobHood. We'll trade you Aquilani for Kaka + Pato + Ã¢â€šÂ¬27m... Wait a minute no we won't, forza Alberto giallorosso per sempre! "tender Alex Silva (Sao Paulo) Ã¢â‚¬â€œ The 22-year-old centre-back, younger brother of Benfica's Luisao, has signed a pre-contract with Milan, who desperately need defensive reinforcements." Is this true? Is he any use? first time i have heard of this. seriously, we're not in "desperate" need for reinforcements... thats a load of bullocks. AC Milan are set to sign Real MadridÃ¢â‚¬â„¢s Ruud Van Nistelrooy this summer, according to confidential sources in Italy. The Rossoneri have identified a top-class centre forward as their number one transfer priority. A penalty-box target man is the exact type of player they are looking for, and this has seen them linked to the likes of Didier Drogba, Emmanuel Adebayor, Dimitar Berbatov and Mario Gomez. However it now seems that prolific Dutch marksman Van Nistelrooy is on his way to San Siro. The 31-year-old is seen as the ideal partner for teenage sensation Alexandre Pato, and there has already been contact last week between Real Madrid and Milan. The Rossoneri have offered Madrid Ã¢â€šÂ¬7m, as well as a three-year contract to Van Nistelrooy. Madrid are prepared to let the former Manchester United man go, because they already have a ready-made replacement in ChelseaÃ¢â‚¬â„¢s Didier Drogba. Van Nistelrooy was close to signing for Milan in 2006 before he eventually signed for the Spanish capital club. you guys couldn't find an older player to buy? Milan are looking to towards BarcelonaÃ¢â‚¬â„¢s Samuel EtoÃ¢â‚¬â„¢o as a possible replacement for under fire striker Alberto Gilardino according to Italian media. The former Parma man has not been in the best of form recently with Milan and he has spent most of the season on the bench. It seems as if the player will be moving to Roma and according to La Gazzetta Dello Sport Samuel EtoÃ¢â‚¬â„¢o could move to San Siro to replace him. EtoÃ¢â‚¬â„¢o has been constantly linked in the past with a move to the Rossoneri and this could be possible as reports in Spain have suggested that Mourinho will replace Frank Rijkaard at Barcelona and take Didier Drogba to the Catalan club which, in turn, would facilitate a move for the Cameroon star to Milan. It seems as if a Ã¢â€šÂ¬40m sum would be enough for the Via Turati club to secure EtoÃ¢â‚¬â„¢o. The 27-year-old would be the perfect replacement for Gilardino and given MilanÃ¢â‚¬â„¢s problems up front this season it would no doubt be a welcome move for the San Siro side. Milan are currently chasing the Champions League places but if they fail to qualify for the competition it may be a deterrent to EtoÃ¢â‚¬â„¢o who enjoys playing in EuropeÃ¢â‚¬â„¢s best club competition. 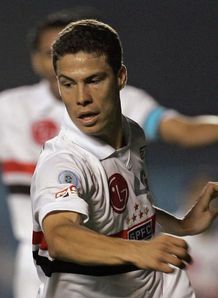 Sao Paulo attacking midfielder Hernanes would be interested in signing for Italian giants Milan. Hernanes is reportedly attracting the interest of Milan, with rumours suggesting the Serie A club could soon make an offer for the 22-year-old. However, the Brazilian international, who featured for Brazil in the 1-0 friendly triumph over Sweden on Wednesday, is unaware of any formal interest from Milan. "I really don't know anything about the reported interest of Milan," he said. "I do not know if it will happen. But if it did, I would be very happy. "It's nice to know that the work you do is being watched by important teams. "Having the chance to play at Milan is something that makes you very proud, but, at the moment, I am committed to Sao Paulo." Milan transfer consultant and super agent Ernesto Bronzetti insists Milan have a fifty percent chance of signing Adebayor and he claims Arsenal want to sell the striker to Barcelona. He also believes the Rossoneri could fuel Adebayor's move to Camp Nou and thay they could take Samuel Eto'o and Ronaldinho to San Siro instead. [quote]The Rossoneri have been after the Togolese hit-man since he impressed them during Arsenal's win over Milan in the Champions League. Adriano Galliani insists that his club are still after the player but reports claim he is heading for the Camp Nou. However, in another sharp twist to the story, Bronzetti claims that the Gunners want to sell Adebayor to Barcelona and he is advising Galliani to bide his time as he could get Samuel Eto'o and Ronaldinho on the cheap. According to Gazzetta dello Sport, AC Milan are on the verge of securing a deal for Brazilian playmaker Ronaldinho on a two-year contract. The Barcelona forward has been linked heavily this summer with both Milan and Manchester City, both of whom will be competing in next seasonÃ¢â‚¬â„¢s UEFA Cup. It seems that the former World Player of the Year has set his sights on a move to San Siro, where Carlo Ancelotti is overhauling his aging squad. According to Gazzetta, Barcelona chief Joan Laporta and Milan counterpart Adriano Galliani have agreed in principle a deal for the player. A fee, believed to be in the region of 15 million euros, has been decided by the duo, and the details of an annual 6.5 million euro contract are in place. Galliani has sought to placate irate supporters with a trophy signing this summer, and had stated his intent on signing Ronaldinho or ArsenalÃ¢â‚¬â„¢s Emmanuel Adebayor. After being seemingly priced out of a bargain for the Togo striker, Galliani looks set to snare the Brazilian playmaker for a relatively economical fee. Ronaldinho will be expected to lead the Milan line with fellow SeleÃƒÂ§ÃƒÂ£o members Kaka and Alexandre Pato. Milan have already secured deals for three new players this summer; Gianluca Zambrotta has been added from Barcelona, Mathieu Flamini joined for free from Arsenal, while Marco Boriello has been recalled from a fruitful loan-spell at Genoa.